Japanese (Nihongo 日本語), spoken by around 128 million native speakers, is the national language of Japan, though not officially designated as such. The literacy rate in Japan is said to be close to 100% of the population, and the country boasts a rich print culture, with one of the world’s highest rates of newspaper circulation. The Japanese writing system makes use of three alphabets: kanji (漢字), logographic characters adopted from China, and the native phonetic alphabets, hiragana （ひらがな）and katakana (カタカナ), along with the English alphabet or latin script, romaji. The official list of “regular-use” kanji consists of 2,136 characters, though the number of characters that most Japanese people recognize may be higher when including kanji used in names and other contexts. 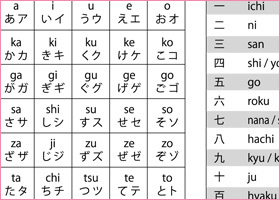 Hiragana and katakana consist of 48 syllabic (moraic) characters that are based on a system of 5 pure vowel sounds. Hiragana is used for native words and grammatical particles and suffixes, while katakana is often used for words of foreign origin, onomatopoeia, and adding emphasis. 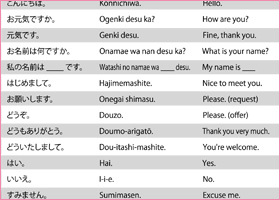 Written Japanese is read horizontally from left-to-right, top-to-bottom (like English), or vertically top-to-bottom, right-to-left, in which case pages should be turned from left to right. Standard Japanese (Hyojungo/標準語), based on the dialect of Tokyo, is understood throughout the country and is taught in schools and used in news broadcasts and official communications; however, variations are abundant in the regional dialects spoken colloquially beyond Tokyo—some of which are mutually intelligible with standard Japanese. The dominant sign language among the deaf community in Japan is Japanese Sign Language (JSL, or nihon shuwa/日本手話), which has been recognized by law since 2011.